On March 21, I had the distinct pleasure to attend an incredible 10 course lunch pairing fine dining dishes with beautiful Cognacs. The event, initiated by the B.N.I.C (Bureau National Interprofessionnel du Cognac) which is the Cognac Trade Council, took place at Balvanera where Argentinian Chef Fernando Navas and Mixologist, Bartender and Cognac Educator Franky Marshall merged their expertise to bring to life this amazing culinary journey. This experience reminded me of the finesse of Cognac and made me realize how misunderstood this iconic beverage truly is. It also inspired me to not only share the incredible food and cognac pairings that I had the pleasure to discover but also to reintroduce the legendary eau-de-vie with a Cognac 101 overview of interesting facts and figures. COGNAC 101: WHAT IS IT EXACTLY? Cognac is a variety of brandy named after the notorious town located in the South of France of the same name. Its origin can be traced back from 1549: Historian André Castelot reports about a merchant from La Rochelle, who produced four casks of good Cognac. In order to be able to carry the name of Cognac, a product must meet some non -negotiable criteria including being produced in Cognac, using certain grapes and respecting a rigorous production process. All Cognac are brandys but not all brandys are cognac. (I think you guys got the point by now). So yes location matters tremendously as terroir (combination of soil composition, climate and humans’ influence) vary greatly from one area to another. The uniqueness of a given Cognac comes from the uniqueness of its terroir. 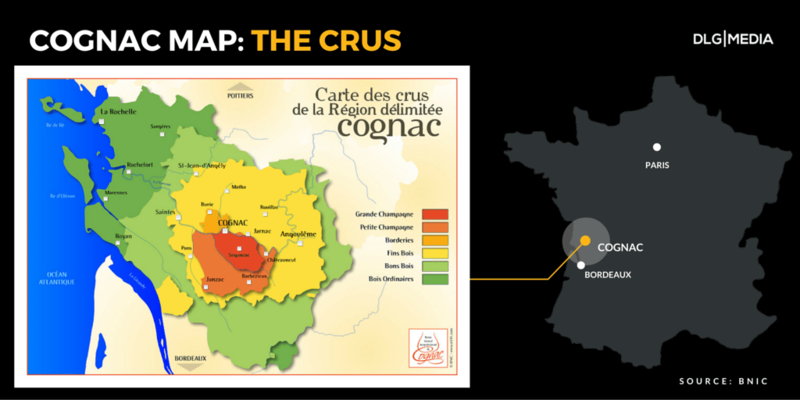 Within the Cognac area, there are also six subregions called Crus that help trace the products further down to smaller zones: Grande Champagne, Petite Champagne, Borderies, Fins Bois, Bon Bois and Bois Ordinaire. Cognac is not different from wine or any other spirit. The aging factor comes in correlation with quality. The B.N.I.C has broken down cognacs into three categories to differentiate the age between all products and guide the consumers : the youngest Cognac blend used in a given product being the point of reference. The XO category is the most prestigious label. 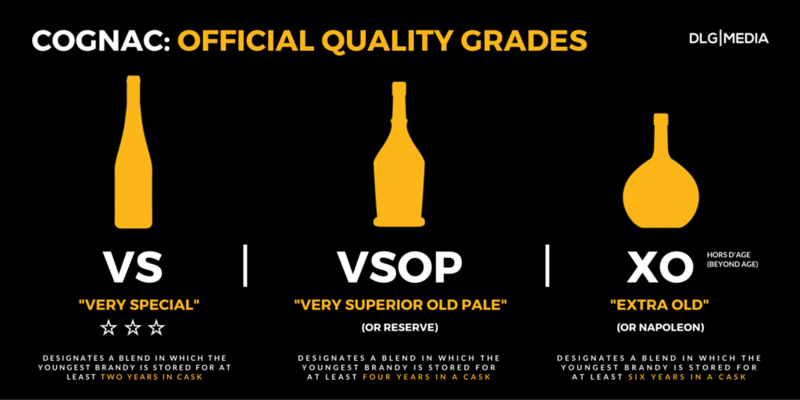 Within the XO grades, producers also use the “hors d’age” (beyond age) denomination to qualify the oldest and greatest quality products. The B.N.I.C plans to raise the “exclusivity” of the XO denomination by extending the youngest blend used in XO to ten years (vs six years currently). According to the Distilled Spirits Council of the United States, In 2015, 12.4 million 9-liter cases of Brandy/Cognac were sold in the U.S., generating $1.9 billion for distillers. 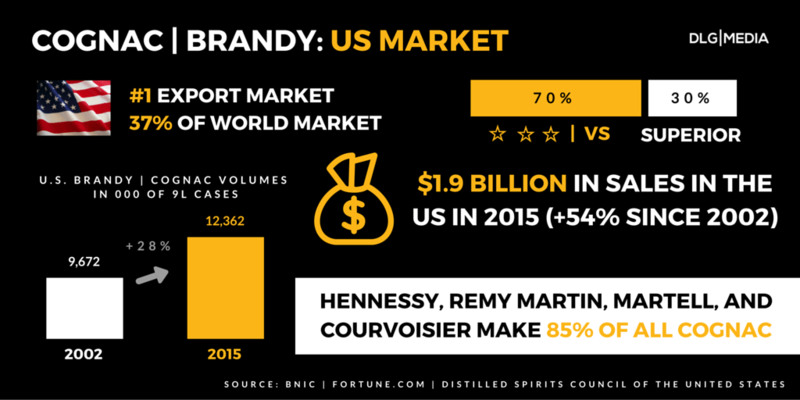 Since 2002, total Brandy/Cognac volumes are up 28%. Cognac sales figures are impressive, and so is its growth. 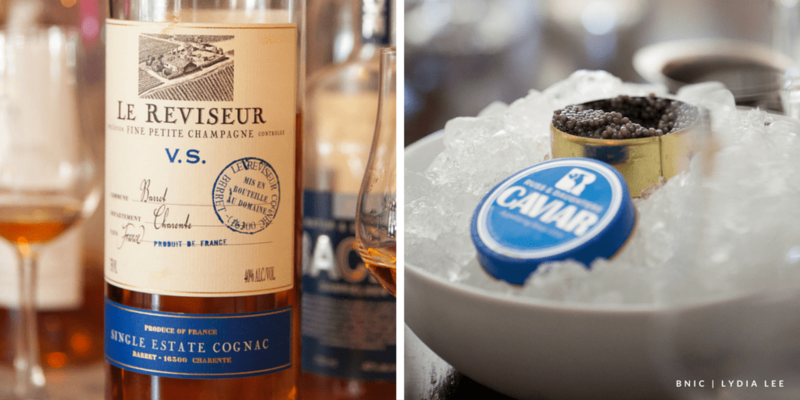 There’s no denying that Cognac is a hot trend in the US market right now. There’s also no doubt that Hip Hop headliners’ “name dropping” brand names in songs has had a positive impact on the popularity of the category; bringing them to the spotlight. How can we forget “Pass the Courvoisier” from Busta Rhymes? However, and while there’s no wrong or right way to enjoy Cognac, it will be caricatural to surrender to the public belief that this fine product is mainly consumed by hip hop lovers in parties: there’s much more to discover and to experience. The March 21 Cognac lunch that took place at Balvanera is a beautiful testament as of how Cognac natural territory (after-dinner drink / or even “at the club”) inherited from public perception can be and should be explored to truly honor this timeless beverage. Indeed, the culinary experience that was brought by Chef Fernando Navas and Cognac Educator Franky Marshall was nothing short of amazing: a 10-course meal paired with 10 different Cognac. 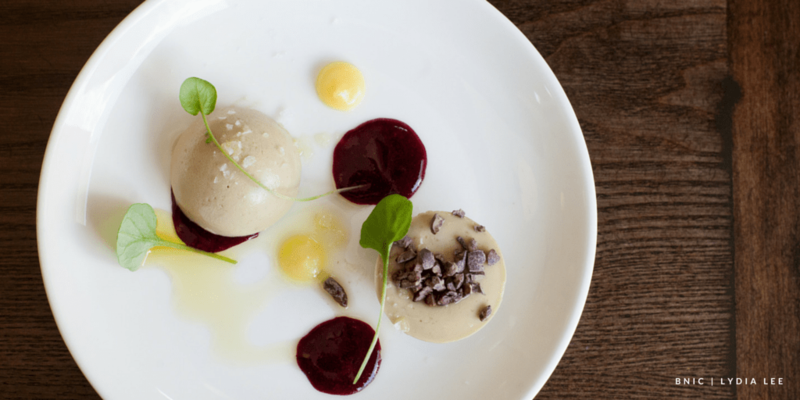 Yes it is possible to pair food with Cognac, and not only with desserts and chocolate. 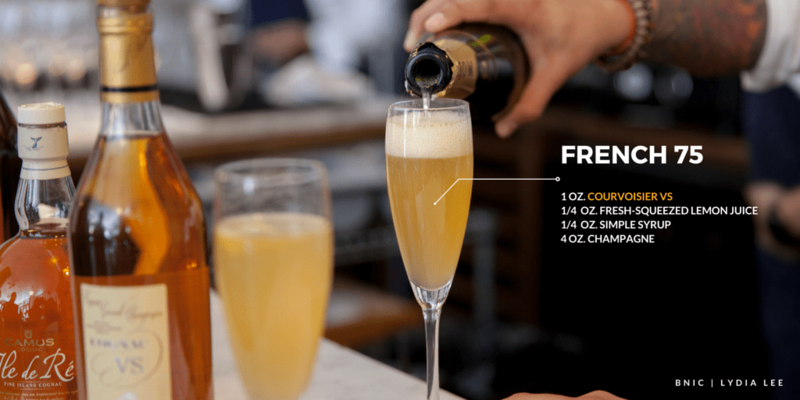 The welcome cocktail was a reinterpretation of the French 75, usually gin based, comprised of Champagne, Cognac simple syrup and lemon juice. This elegant and simple cocktail is a must try! While I enjoy cognac mainly neat or on the rocks, you will be delighted by the finesse of this version of the French 75. 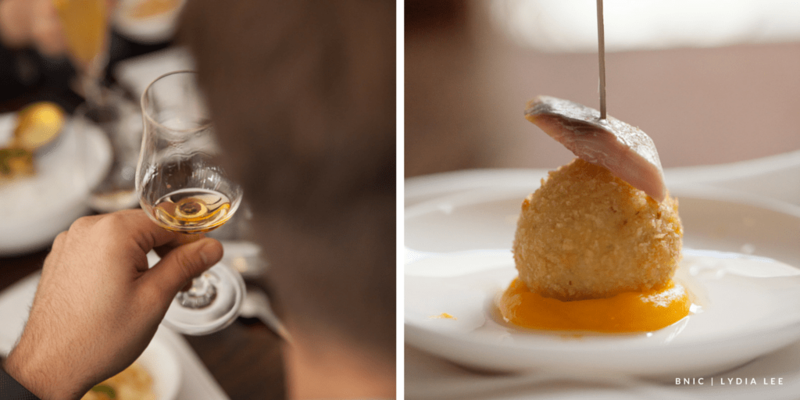 The smoked herrings croquette paired beautifully with the VS Camus Ile de Ré. The fresh marine notes of the Cognac along with the higher iodine content of the grapes went very well with the saltiness of the herring and the creaminess of the croquette. The following pairing was probably my favorite: it was a Cognac Park VSOP paired with foie gras. Chef Fernando Navas did an incredible job with this recipe. 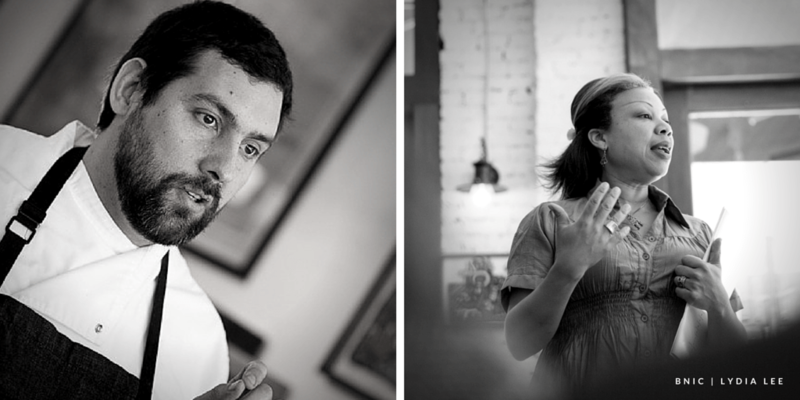 When asked how he prepared the foie gras, the chef explained that he marinated it with Cognac. The smoothness of this dish was unreal. The pairing was spectacular: the fat and the aromas of the foie gras paired perfectly with the alcohol of the VSOP. Hands down one of the best pairing experiences of my life. The fat of the meat must be incorporated into the muscle fiber. Adding salt enhances the pairings with the old Cognacs (VSOP and XO). The role of cooking: the tenderness of the meat must be carefully preserved during cooking. The presence of blood is a good indicator. It creates a natural bond between the Cognac and the flesh of the meat. 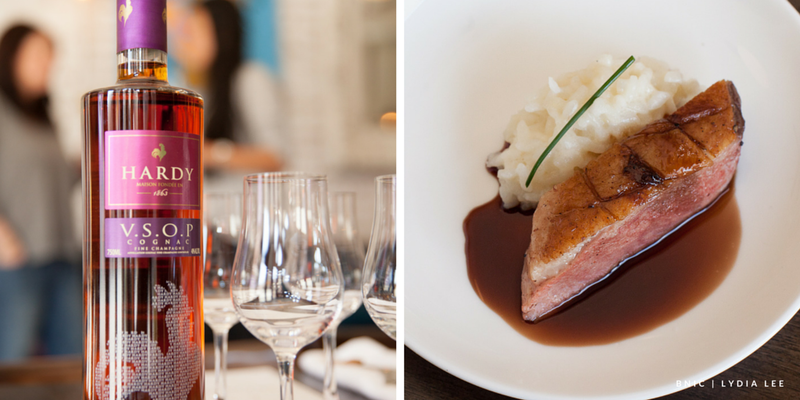 Chef Navas and Franky Marshall knocked it out of the park with this beautiful duck breast paired with the Hardy VSOP. The last pairing I want to highlight is the White Chocolate Cremoso: raspberries, olive oil sorbet, mint with my favorite Cognac, the Hine Antique XO. 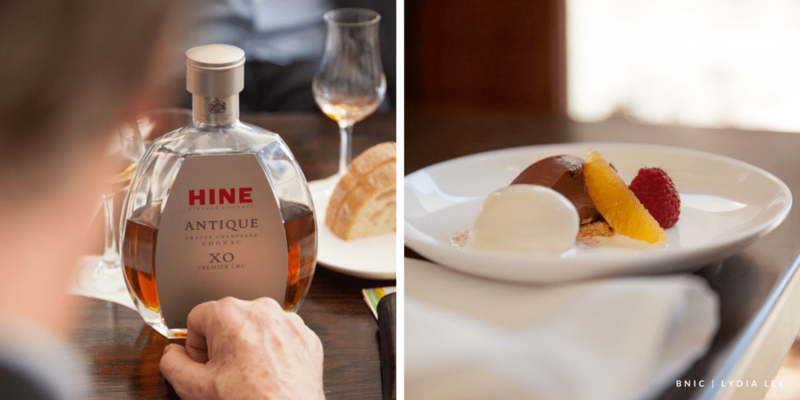 I usually enjoy my Hine Antique XO on its own: this cognac is incredibly smooth. Complex, rich and long-lasting on the palate. I absolutely love the notes of vanilla and baked apple. It is really a must try! I would like to thank the B.N.I.C for the kind invitation: I was honored to have been part of this amazing culinary experience. Make sure to follow their account on Facebook, Twitter and Instagram. I sincerely hope this little piece inspired you to rediscover this beautiful beverage and that you learned a thing or two. Next time you are planning a nice dinner at home or in a restaurant, consider trying a cognac en lieu of wine. I promised you that you will be pleasantly surprised! Please share with us your experience with Cognac. How do you experience it? Great article! Didn't know all that information about Cognac. Loved the photos as well!